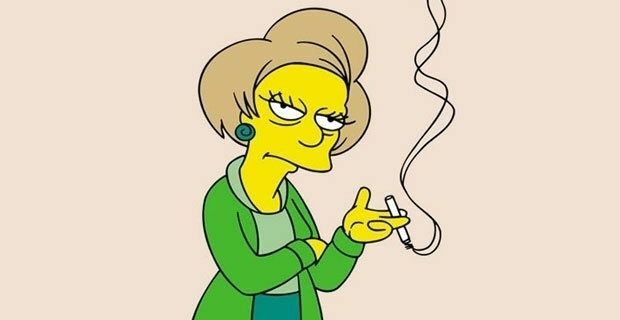 The Simpsons producers are planning to kill off one of their central characters, and the smart money is on Edna Krabappel, the gravel-voiced, long-suffering schoolteacher. Given the amount of smokes Edna has got through on the show, it's a miracle she is still alive. With the show about to begin a 25th series, it's hardly surprising that The Simpsons has been running out of novel plot ideas for years. Killing off Ned Flanders's wife a few years back seem to strangely inject some vitality into the show, so it's time for another cull. The bookies' favourite for the axe is Edna, who happens to be Ned Flanders's new wife (who knew? Some Sky refuseniks are a couple of series behind). Edna, voiced by Marcia Wallace, has been around the block a few times, having previously dated two of the show's persistent losers Principal Skinner and Moe Szyslak. Widowing Ned a second time seems a little did-did-diddly-cruel. Executive producer Al Jean confirmed that a character would be killed off, but didn't really narrow down the field. "I’ll give you a clue that the actor playing the character won an Emmy for playing that character," Jean said, "but I won’t say who it is.". Given that The Simpsons has won 25 voiceover Emmys since 1992, that doesn't really help. Other candidates for the chop, according to the bookies, are headed by Sideshow Bob and Comic-Book Guy, although neither could strictly be called central characters. Happy to jump on the publicity bandwagon, William Hill's Joe Crilly confirmed that Edna is the likeliest option. "It is a long time since a Simpsons death and this is going to be a big deal," he said. "Having had to put up with Bart's antics over the years and dating Principal Skinner, her misery looks set to be compounded by croaking this series." Really? We're having a fiver on Krusty The Clown at 10-1. You read it here first.